The acclaimed bestselling author of Abraham and Walking the Bible takes readers on a heart-racing adventure to the frontlines of Israel, Iraq, and Iran and discovers an unexpected source of hope. “The collision of politics, geography, and faith has dominated nearly every story in the Middle East since the birth of writing. It also dominates the greatest story ever told Nowhere is the struggle between faith and violence described more vividly, and with more stomach-turning details of ruthlessness, than in the Hebrew Bible. At a time when America debates its values and the world braces for religious war, National Public Radio commentator and PBS presenter Bruce Feiler travels 10,000 miles through the Middle East-Israel, Iraq, and Iran-and examines the question, “Is religion just a source of conflict or can it be a source of peace?” Part wartime chronicle, part archaeological detective story, part personal spiritual exploration, Where God Was Born takes readers to biblical sites not seen by Westerners for decades and uncovers little known details about the common roots of Judaism, Christianity, and Islam. In his intimate, accessible style, Feiler invites readers on a never-in-a-lifetime experience, retracing the Bible through the bloodiest places on the planet, from the Garden of Eden in war-torn Iraq to the rivers of Babylon just south of Baghdad; from David’s conquest of Jerusalem to Queen Esther’s face-off with the King of Persia. At each site, Feiler discusses the Bible with local characters, from archaeologists to army chaplains, and draws lessons for fostering reconciliation in our time. Beginning with a daring helicopter ride over the West Bank and climaxing with a hair-raising airlift into Baghdad, Bruce Feiler redefines some of the greatest stories ever told, including Joshua’s conquest of the Promised Land, David’s showdown with Goliath, and Jonah finding God in the whale. 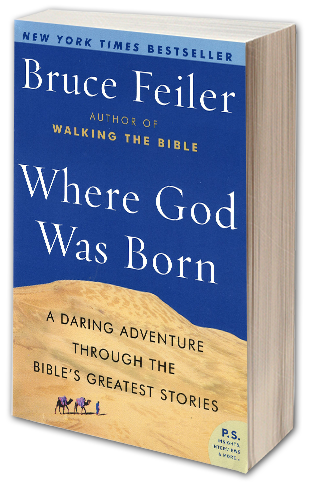 Where God Was Born is a powerful, inspiring story, sure to make headlines, that offers a rare, universal vision of God that can unite members of different faiths into a shared allegiance of hope.